A person instinctively feels that this world cannot satisfy him. Some are more idle, others less, but everyone has a desire, a wish for something that he is ready to enjoy, and the only question is how much effort one is prepared to invest in order to get what he wants. In truth, the problem lies in whether or not I arrange the order of priorities, the scale of values. Suppose I wish to become as wealthy as Rothschild. I then begin thinking: "Even if I achieve success, it will take an entire lifetime. Is it worth it? It probably is not." Everyone makes their own calculation, depending on the circumstances. We weigh and compare the profitability of certain goals in life. What should I do if I find many goals I would like to achieve? Spirituality also appears on this list, perhaps as first, second, or tenth. But additionally there are more profitable things: wealth, recognition, health, and so on. It turns out that our challenge is in elevating the importance of spirituality in our eyes, raising it from the bottom of the list to the very first priority. This can be accomplished only with the help of the group. The environment has the capacity to obligate me to think in a certain way, even if it is totally unjustified from the point of view of egoism. The spiritual world for me is something blurry; I don’t see anything useful in it, and yet, I begin wishing to enter it. If the group gives such importance to and talks about it, and if from every direction I hear about the exalted nature of a spiritual goal, then I, too, start yearning for it, even if unaware of what it is. I wish for it more than anything else. Thus, the problem is not in my individual desire. Do not be distressed if it is weak and overpowered by desires of the heart, the intellect, and even the stomach. I should only worry over the fact that I don’t wish to enter the group that will elevate the spiritual goal for me. And that is the problem. We have repeatedly heard about Rabbi Yossi Ben Kisma who refused to leave his disciples for the sake of an honorable and well-paid position in another city. After all, they were the ones who gave him the importance of bestowal. They may have been beginners, knowing nothing yet, but their hearts were burning and that was more than enough. They again and again awakened him. Similarly, someone at a higher spiritual degree, surrounded by the lower degrees, becomes inspired by them. We “plant” our children in the same way, like a seed planted in soil, which begins sprouting. The earth, the still level, supplies the seedling with mineral, salts, and other nourishment. The sun, air, and water are also elements belonging to the inanimate level, but these specific forces cause them to bloom in to the next spiritual degree. If you lower your head before the group, despite the fact that you think they are beneath you, then their influence and desire elevates you to bestowal, and you bloom. The Creator constructed a strict system of laws, and “the Upper Light remains at absolute rest.” Desire is also already made as it is; it only gets developed by the Light and keeps feeling (discovering) itself, comparing itself to the Light. The Light affects the desire, enters it, and passes through all its layers: 0-1-2-3. And when it reaches the 4th level (Behina Dalet), only there free will emerges in us. But it lies solely in our ability to change our attitude. However, by changing our attitude, we change our perception. If you wish to understand the Creator and become like Him, you begin to feel His goodness. Baal HaSulam writes in his “Introduction to The Study of the Ten Sefirot” that our only problem is that we don’t comprehend His Providence. We stand against Nature (the Creator), so to whom can we make claims? During our entire history, we were developing by the steps of 0-1-2-3, as the still, vegetative, and animate levels of nature. We were forced to evolve unconsciously, led either by the pressure of pain or attraction of pleasure. But when we reach the 4th level, we must familiarize ourselves with this process and learn from it about the Performer of all actions. In other words, we need to learn about His work, understand what He does, and transform ourselves in order to bestow, that is, become like Him. Then, “from His actions we will know Him.” When we get to know Him, we start justifying Him and become similar to Him, meaning that we ascend to His level. And all of this is based on intention. It isn’t just an attitude; thanks to intention, we start getting to know the Creator and feel His actions within us, in their authentic form. When I rise above my egoism and make a restriction, the screen and the Reflected Light, I become equivalent to the Light! Conversely, I begin to comprehend His true attitude toward me. In the Light that dresses me, I experience “tastes” (Ta’amim) or the Creator’s attitude toward me: what He expects from me and how He feels about me. I get to know the Source from where everything comes to me and thereby cleave onto Him. I begin living not by my own desires but by His. Why Fight A Kind Embrace? A Joke Or A Strict Law? Question: If the Creator’s plan is to bring man to the purpose of creation, what did He gain from the events that took place in Israel at the beginning of the month? What is their outcome? Answer: I am not going to check how the people changed. We act along the axis of time: There was a state before the fire, then there was a fire that took people’s lives and destroyed vegetation, and when it was over, the rain fell. Indeed, it is exactly as the Torah describes: If Israel is unworthy, the rain falls at the wrong time in the wrong place. It is the law of nature. 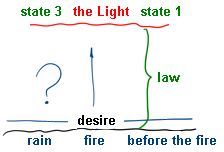 Above there is the Light, and below there is the will to receive (desire) that must reach equivalence with the Creator. The Light constantly works on desire, and the latter keeps changing. The Creator does only this calculation: two states, the initial and the final one, must be the same. Based on this, He acts. Just as the Light created four phases of expansion of the Direct Light, it continues to develop everything within them. Why then do you think the Creator will respond to your prayers? In this case, you are worshiping an idol. You view Him as wishing stars that bring luck, as if with their help you may change your fate. It’s true that you can learn something about the future, but changing it is beyond your power. Question: How do we calm down the ego which demands constant fulfillment? Answer: You’ll never be able to overcome your ego with your own strength. Even if you think that in the past you were able to do so, that was only an illusion. You were simply fulfilling your desire to receive pleasure. Then you suddenly cool off to studying; you ran out of fuel and feel tired of everything. Now you’ve entered the second stage of the preparation period. You are no longer led by the ego and you need a new stimulus: studies with intention and the environment. Now you have to advance by receiving strength from the group and not from your own desire. The purpose of your studies shouldn’t be to obtain knowledge, but rather to build the correct intention for your desires, which you receive from the group. You must unite with the group in order to reveal the Creator. For now you’re doing it for the sake of self. However, by continuously doing this work and as a result of the Light’s influence, you gradually begin to feel that bestowal is good. You receive the desire to bestow from the group and begin to demand this quality from your studies. Bestowal frees you from the ego, from your evil inclination, and elevates you above this corporeal life. Later, due to the influence of the Upper Light and connecting with friends in the group, you begin to understand that your goal is not to reveal the Creator and the spiritual world, but rather to adhere to Him, to bestow to Him rather than to receive from Him. By uniting Israel, the Torah, and the Creator into one, by striving to give the Creator pleasure, you receive the perfect formula for your spiritual ascent. In Spirituality, We Don’t Exist! The Creator intentionally confuses us with His governance so that we can’t find where it starts and ends, as if He doesn’t exist at all. But if He revealed Himself to me right now, my “self” would cease to exist since it is He who carries out and controls everything one hundred percent. It is hard for us to understand that in the spiritual dimension, we simply don’t exist for our present nature is egoistic. My individuality begins emerging only when I start resisting Him. My spiritual reality starts with Pharaoh from whom I must take all his might. This is what we call “to resist the Creator.” Otherwise, how will I grow? Later on, grounded in this resistance, I acquire the form of the Creator. However, it occurs in accordance with what I myself have planned having examined, discerned, and decided that this is exactly what I have to and should do. Therefore, I have to include two opposites within myself: darkness and the Light, or I will never grow independent. That is why the Creator gradually awakens us by sending all sorts of problems to us so that we may aim ourselves correctly. Question: How can we understand Reshimot in spiritual work? Can we perceive or understand them? Answer: I do not hear how they are “clicking,” but I feel how I change from one moment to the next. These changes are the result of Reshimot that awaken along the chain that was built during my soul’s descent along all the degrees from Infinity down to this world. Now I ascend back along the same degrees, but only on the condition that the Light comes and the Reshimot change. In reality, everyone ascends up this ladder, but every person does it differently: either by way of suffering or by way of Torah. The Light pours upon everyone, but each person uses it to the degree he is able. Inside this integral, single system, we all influence one another, and therefore the personal corrections on the path interweave with the group and universal corrections. If we could take a bird’s eye view of the whole system and discern all the phases of its development, we would see the connection between the events in our world and would understand how inside the complex they advance certain parts toward correction. And this also happens either by way of suffering or by way of Torah. In addition, we would see how by working with each other, we awaken the world more and more from the inside, and thereby help everyone take the right steps. Thus, the world advances toward the goal quickly and easily, instead of by the lengthy and painful way. I Don’t Want Anything But The Light! For Whose Sake Should We Demand Unity? Question: What should I do if I don’t wish to be part of the group and am only pretending because I am told that it is necessary for reaching the goal? Answer: I should pretend not because I must but in order to help the friends, give them strength. In truth, I play against and confuse my egoism. I put in all my strength, but it is insufficient. In the meantime, I realize that if the group radiates all its might toward me, I will get inspired and be able to rise above myself. So how do I instill such “illumination” in the group? To achieve this, I perform bestowal to the friends. I pass my awakening onto them, envelop them in warmth, and inspire them despite lacking it myself. I intentionally pretend in order to receive the same from the friends in response, only one hundred times more. After all, my pretense ignites them, whether they like it or not. And it doesn’t matter that I am lying; they get inspired nonetheless and radiate it back to me. Hence, it turns out that my artificially blown out spark becomes a real flame. I started with pretense, but as a result, got truly ignited. And all this fire coming from the desire is mine. By utilizing the environment, I have accomplished the goal of transforming egoism into bestowal. The group, like an amplifier, has multiplied my first meek inspiration manifold. And now, with this hard-earned desire, I turn very seriously to the Creator and without any falsehood.